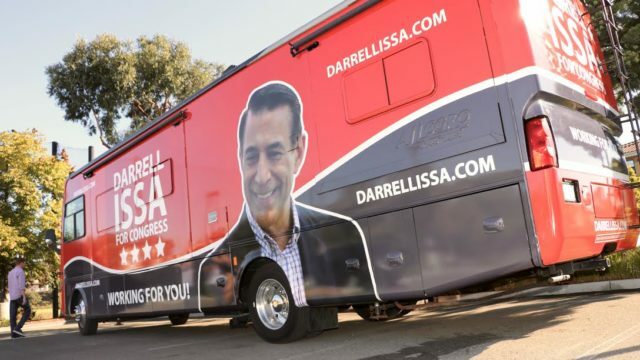 After President Obama called him the “definition of chutzpah,” Rep. Darrell Issa has launched a “chutzpah” bus tour of his district. Obama called out Issa after the Congressman used a photo of the president in a mailer. “This is now a guy who because poll numbers are bad has sent out brochures with my picture on it, touting his cooperation on issues with me,” Obama said during a visit to California. The 10-term Congressman, who has endorsed Donald Trump, faces the toughest re-election fight of his political career against Democratic newcomer Doug Applegate. The 49th Congressional District spans north coastal San Diego county and south Orange County. It has traditionally been a Republican district, but is becoming more Democratic.